Apple has officially unveiled the future of the smartphone in the OLED iPhone X, the company's nod to the tenth anniversary of the iPhone itself in a presentation at the venue named after the founder of Apple —Steve Jobs Theater. The iPhone X (Ten) Super Retina Display is edge to edge, and has a HDR 2436 by 1125 resolution at 458 pixels per inch —and no home button. 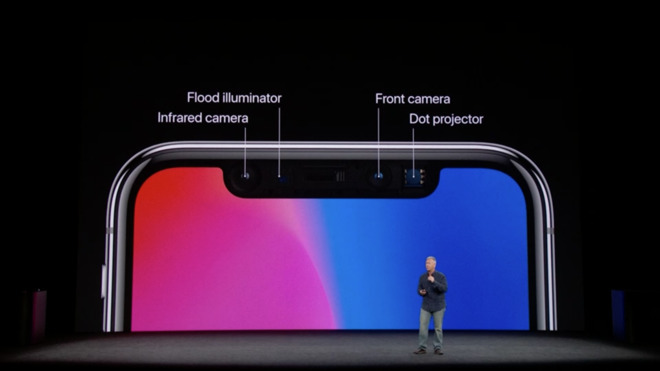 As predicted, a notch is cut out of the top of the screen for the speaker, forward-facing camera, and the new 3D facial recognition sensor. Speaking to other design features, the phone has a glass back, vaguely reminiscent of the back of the iPhone 4. A "surgical-grade" stainless steel frame surrounds the device. Home button functions are replaced by a swipe up. Siri in invoked by pressing and holding the button on the right hand side of the device. The iPhone X is locked until the user looks at the phone, and it recognizes the user. 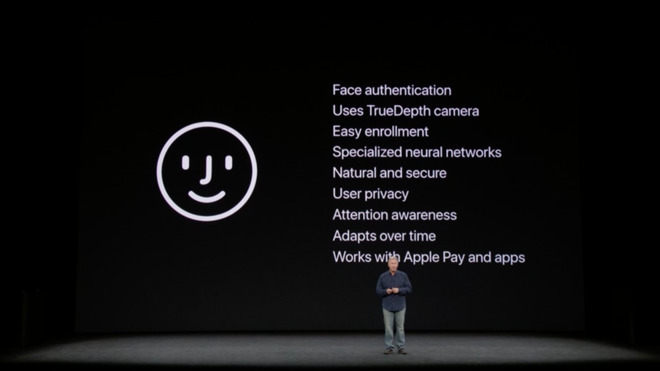 The feature, called Face ID, Apple is calling the future of smartphone unlocking. The TrueDepth camera system is made up of four components including an infrared camera, a flood illuminator, a dot projector, and the front camera. The combination of sensors generates a 3d map of the face, and isn't reliant on image comparison. Rather, the system compares the mathematical models of the stored face and the face in the front of the camera's sensors with machine learning with a new A11 Bionic neural engine. Apple claims that hats, hairstyles, glasses, or makeup will make no difference to identification, and will adapt to the user as the face changes over time. The phone will not unlock if the user's eyes or closed, or its looking away from the phone. At launch, the system will work with Apple Pay, and third-party apps as well. The device is powered with the A11 Bionic processor. Where the A10 in the iPhone 7 family had a pair of high power cores, and a pair of high efficiency cores, the new processor boosts the number of high efficiency cores to four. Connectivity is provided by 4G LTE radios from an unknown vendor, 802.11ac wi-fi, and Bluetooth 5.0. The Lightning port capable of quick-charge, similar to that in the iPad Pro. 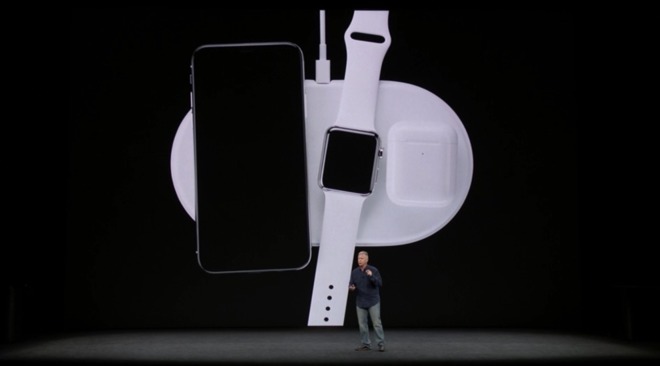 The iPhone X can also be wirelessly charged, using the open Qi protocol. Regarding the camera, Apple has retained 12 megapixel sensors in the rear shooter iPhone X, with a new vertical dual-camera array similar to that in the iPhone 7 Plus. As improvements over the iPhone 7 Plus, the camera has dual optical image stabilization instead of just one one lens, and quad-LED True Tone flash. The same features that were announced for the iPhone 8 had regarding the dual sensor array, including portrait mode, optical zoom, and portrait lighting mode are in the iPhone X as well. Apple also notes that the iPhone 8 will last up to two more hours of battery life. Testing conducted by Apple in August 2017 using preproduction iPhone X units and software and accessory Apple USB-C Power Adapters of 29W and above charge the device "up to 50 percent in 30 minutes" from completely drained —but at additional cost. The iPhone X ships with a 5W USB-A charger. The iPhone X will sell for $999 for 64GB of storage, with the 256GB model listed at $1149. Color options are silver or space gray. Apple notes that pre-orders start on Oct. 27, with the first wave of devices scheduled to arrive on Nov 3. It is not clear how constrained supplies will be when they start shipping, or when any will appear at retail.